Has Philadelphia's Papal Housing Bubble Burst? If you're thinking of renting out your home during Pope Francis' visit to Philadelphia this fall, perhaps you should think again. Many of those hoping to skip town and cash in are getting disappointed. Mark Zajak listed his modern, three-bedroom row house in Philadelphia's Fairmount neighborhood two months ago. It's just a 10-minute walk to the Benjamin Franklin Parkway where Pope Francis is expected to make two public appearances — including a huge outdoor Mass — when he visits the city the last weekend in September for the World Meeting of Families (WMOF). While the four-day WMOF conference is expected to draw only 15,000, the city estimates between 1.5 and 2 million people could flock to Philadelphia for the weekend papal visit on September 26 and 27. Factoring in the couch and leather loveseat in the Zajak's living room, the house could comfortably sleep eight travelers. There's also a crib and a daybed, attractive items for those attending with kids in tow. But the pièce de résistance: a roof deck connected to the master bedroom. "You can actually see the top of the art museum over there and I believe that is where the pope is going to be delivering his Mass," Zajak said. How much for this view? Zajak and his wife, Kim started out asking $16,000 for the whole week. They recently dropped the price to $14,000. They're willing to negotiate. "I actually am disappointed," she said. "We haven't had anyone reply yet, so hopefully soon." She wants to use the money to go on vacation in the Bahamas, but her dreams of the Atlantis Paradise Island Resort may not come true. That's because the Zajak's aren't the only ones having trouble finding papal renters. David Simpson, who until recently lived in Los Angeles, listed his parents' house in Moorestown, New Jersey on Airbnb back in March, asking $7,000 a night — what he calls the "dream price." He hasn't gotten any inquiries, although the listing is getting a lot of eyeballs. "I have my listing up in Los Angeles which I rent relatively frequently and I don't get as many views on this property that I have here as we do on the New Jersey one," Simpson said. Judy Bailer, who has a background in real estate, listed her house in Point Breeze for a more modest weekly rate of $5,000. She even dropped the price for a "24-hour flash sale." "We've done that with selling properties in the past and it's worked really well for us," said Bailer. She hasn't gotten any calls either. So has the papal housing bubble burst? Let's look back at another event that brought throngs of people to an American city: 1.8 million people traveled to Washington, D.C. to see President Obama's first inauguration in 2008. Much like Philadelphia, hotel rooms in the D.C. area filled up quickly and thousands of people put up entire homes, apartments and guest rooms for rent on sites such as Craigslist and InauguralHomes.com. Media reports generated buzz about the high rates some were charging, which enticed even more people into the short-term rental market, hoping to make some extra cash and leave town before the crush. However, by the time Inauguration Day rolled around, many who had listed properties couldn't give them away. 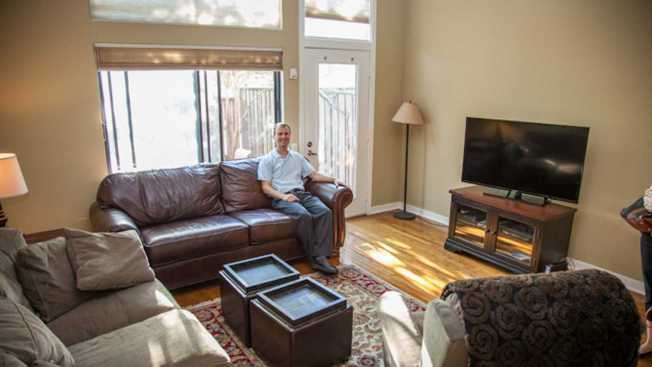 "I feel like initially we had an influx of calls that basically went nowhere and then radio silence," said Tania Odabashian whose company specializes in short-term, furnished apartments for business clients. For the inauguration, she set aside 20 studios and one-bedrooms in D.C.'s Foggy Bottom neighborhood and charged $300 per night, far less than what others were asking for. Six years later, it still bugs Odabashian that she wasn't able to rent those apartments. She blames the media attention on sold-out hotels and high rental rates. "I think those that might have come and been happy to pay $300 a night for an apartment were thinking, 'Holy crap, there's no way I'm gonna get a room' and didn't even try," she said. In the end, the supply was much bigger than the demand — and that was before Airbnb existed. When NewsWorks first reached Odabashian, she was at her house in Margate on the Jersey Shore and had just been talking to her neighbor from Philadelphia who runs a bed and breakfast near the Art Museum. Her neighbor, who asked to remain anonymous for business reasons, says she also hasn't gotten a single call for the papal visit. She and others in Philadelphia are still optimistic. After all, there are more than two months left until Pope Francis arrives for the weekend on Saturday, September 26. "I believe people still aren't sure where they're going to stay," said Brent Rovner who in January created Popedelphia.com, an online marketplace just for papal rentals. The site has about 150 listings and includes a "pope rent calculator" based on mortgage price, distance to the Parkway and the number of bedrooms. Rovner also took into account the prices of hotel rooms. He and his wife listed their own place on the Benjamin Franklin Parkway on the site, so he's banking on a last-minute rush in August and September. They're asking $10,000 for the week and are hesitant to budge on the price. But people like the Rovner's aren't the only ones looking to cash in. Philadelphia City Council legalized short-term home rentals and starting this month, will tax them like hotel rooms. Councilman Bill Greenlee deliberately pushed the bill ahead of Pope Francis' arrival when rates could be highest. Like the 2008 inauguration, those who listed their homes shortly after Pope Francis' visit was confirmed in January were likely more successful. However, high rates in the tens of thousands of dollars are a myth, according to Fairmount real estate broker Julie Welker. One reason is that the World Meeting of Families is offering cheaper options as the event draws people from a range of socio-economic backgrounds. As of last week, 1,850 people have signed up to take in guests through the WMOF's Host-A-Family program, which encourages hosts to charge a minimal fee. Some are charging nothing. Others are making their own arrangements. A group of 400 people from Spain are staying at a YMCA campground in South Jersey, according to WMOF Executive Director Donna Crilley Farrell who said there is still a need for more housing. However, it's not clear those looking to rent their homes and apartments are going to see a windfall. "I'm not hearing that the crazy prices are renting," Welker said. "Prices within reason, I have heard of some success stories." Kim Zajak was motivated to list their Fairmount home when she heard an acquaintance of hers had rented out her place in South Philadelphia for $20,000 a few months ago. We emailed her friend, Kristin Walsh to see if that was true. She wrote back saying no, and in fact, she hadn't even listed her home. "Not sure if there is a lot of demand," she said.